Have you ever had a flight, where you are perhaps traveling alone with a small child who is tired, and your plane is delayed for hours and said child decides that the most convenient moment for them to stop cooperating is when you have to get the two of you and your stuff half way across the airport? Early on in my parenting days, that was me and my daughter and the situation eventually escalated to her unbuckling herself from her stroller and throwing herself on the ground kicking and screaming. It was not our finest travel moment to say the least. Now, I am older and wiser and have friends who frequently travel with their kids. When I am getting ready for a trip I will often consult my friend Elise on the particulars, like whether or not to bring a car seat on a plane ride to Europe (depends on the age and temperament of your child), or what the latest travel gizmo is. Elise and her family (which includes 3 girls that are ages, 2, 5, and 6) are experienced travelers to places near and far and she has got her travel system down. We sometimes joke about how she can get her family of small children through security faster than some adults traveling on their own. That requires some finesse my friends, so we asked her for her top tips on keeping it all together while traveling with young children. These tips will make your travel days easier and I wish I had had them years ago. 1. Make a plan and make sure everyone knows the plan. Planning is key when traveling with kids. Before we head to the airport we remind our kids about all of the steps involved in getting us from Point A to Point B. We narrate the whole day for them and make sure to focus on the fun parts (like the new airplane activities or snacks). We also talk about how we are going to board the plane, behavior we expect on the plane, and who is going to sit where (so there is no fighting). When everyone knows the plan (even our two year old) our day seems to go better and now that we've flown enough times our airplane travel has a certain rhythm and predictability to it (right down to when to expect meltdowns). 2. Wear coordinating colors or matching t-shirts. Since we are now outnumbered (three kids/two adults) we like to dress our kids in a way to visually help us stick together. We usually have everyone at least wearing the same color, if not the same shirt or dress. This helps us easily spot kids that try to run away or get lost and it helps other people help us. There is also something about clean, well-dressed kids that makes everyone around us on the plane nicer to us so we always make sure to look pulled together (at least at the start of the day). Not sure why that is, but we need all the help we can get. 3. Lower your expectations. I used to be a pretty anxious flyer when my kids were really little. Over time I learned to envision in my head the worst possible scenarios that could happen on our flight (i.e. run out of diapers, majorly delayed flight, sick kids) and then I prepare for the worst. Sometimes our flights are near perfect and sometimes they are nightmarish. But, I never expect things to run smoothly and then, if they occasionally do, I am pleasantly surprised. It might seem like a mind game, but by controlling my anxiety I also have been able to stay calm in hard situations and keep my kids calm too. 4. Bring a lot of snacks. We never rely on airport food. Some airports have amazing food choices and some are horrible, we always like to bring something with us. When I know we are going to have a layover on a full day of flying I pack all of our meals just in case we are delayed and don't have time to grab food. We like to bring a mix of healthy snacks (apples, carrots, yogurt, cheese sticks) and snacks our kids don't get as often (themed fruit snacks, goldfish, 100 calorie snack packs, vanilla wafers, etc.) We try not to feed our kids too much sugar when they travel to avoid a sugar high, but we also keep Dum Dums around for emergencies and to reward excellent flying behavior. 5. Customize activities to each child. Every kid is different. My five year old will watch Star Wars for an entire flight over and over again and my six year old likes to color and do crafts. My two year old changes what she is interested in every single time we fly. I feel that my role as a responsible parent is to make sure my kids have enough stuff to do on a flight so they do not bother other passengers. I know we can only do our best, but at least I always know I've tried to help my kids be respectful of other people. I keep our travel backpacks stocked with dollar store toys and activities and leave them in our travel closet. My husband's job is to add new game and movies to the iPads before each flight. We change up the iPad content depending on our kids' current interests. Everyone's backpack content is slightly different and my kids love having a few new things to do. The anticipation alone about the fun new things in their backpacks usually helps us to motivate good behavior from the airport parking shuttle until they board the plane. Lastly, I would add, get sleep the night before you fly. These tips might seem really simple, and there is a lot more the I could add, but when I am well prepared for a flight (mentally and physically) it usually tends to go well and I can handle whatever things come my way. Also, when I'm prepared and things do not go well at least I know I tried my best and I am usually able to laugh about it rather than cry. We can't wait to incorporate these tips on our upcoming trips. I love the idea of customizing my kids backpack activities, as well as their iPad content. Also, how wonderful is the thought about lowering our expectations for a smooth flight? I know a lot of times when I am upset or flustered it is because of the expectations I had of a situation vs the reality. 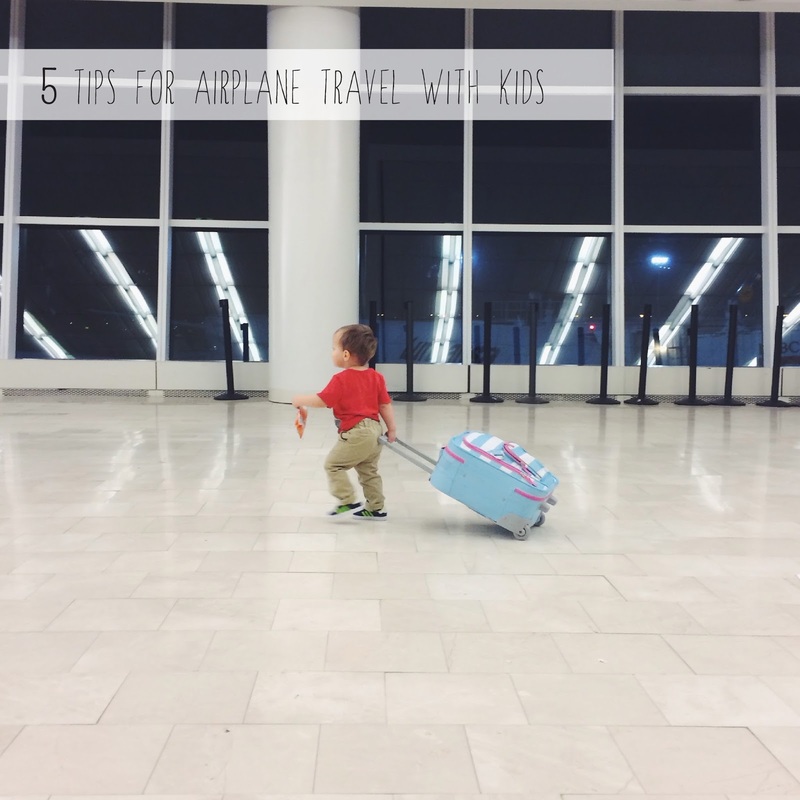 What do you do when flying with kids? Any additional thoughts on how to make flying with kids a smooth experience? Such good advice! As a frequent traveler myself, I especially love the offhand mention of a "travel closet." I'm going to rearrange and create one of those this weekend! Thank you! Isn't a travel closet a fantastic idea? And best wishes with your upcoming travels- I can't think of a better or more intimidating way to spend your summer.